This is an expanded version of an op-ed piece originally published in the Halifax Chronicle-Herald. See David Campbell, Jonathan Roberts, Corey Slumkoski and Martha Walls, “‘Mother Canada’ elevates bombastic heritage over subtlety of history,” Halifax Chronicle-Herald, 5 June 2015. This is to be expected; new military technologies meant that the First World War saw death and destruction on a scale like never before. Canada was not immune from the horrors of the conflict; approximately 60,000 Canadian lives were lost during the war, or roughly one percent of our population. Shockingly, Canadian sacrifices paled in comparison to those made by some of our European allies. France, for example, saw over four percent of its citizens killed. Clearly, the story of the sacrifices made by men and women in uniform is something that we mustn’t forget. Recently, a proposal has come forth calling on Parks Canada to allow a private foundation, led by businessman Tony Trigiani, to build a memorial in Cape Breton Highland National Park in order to honour all Canadian lives lost around the world to war and conflict. 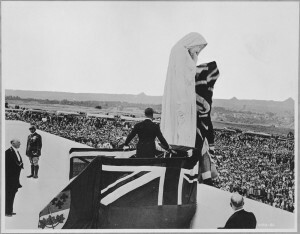 Dubbed the Never Forgotten National Memorial, the timing of the monument’s creation is linked to the commemoration of the 100th anniversary of the First World War, and the monument’s proposed centrepiece, Mother Canada – a 30-metre tall woman with arms outstretched as if to receive Canada’s war dead – is overtly modelled after the Canada Bereft monument found at the Canadian National Vimy Memorial in France. Trigiani and his foundation propose to build more than just a simple monument to Canada’s war dead – their plans also call for a 300-vehicle parking lot, a restaurant, an interpretive centre, and, not surprisingly, a gift shop. Depictions of the proposal can be found in a variety of news reports, such as this one, and on the Never Forgotten National Memorial Foundation website, which offers a virtual tour of the proposed memorial. The Mother Canada memorial has become a flashpoint of controversy in Nova Scotia. Proponents argue it will bring much needed economic development to an underdeveloped part of Cape Breton and it will be more accessible to the average Canadian than the monuments and cemeteries located on overseas battlefields. Moreover, they suggest that opposition to the plan, no matter how principled, is rooted in anti-veteran sentiment. And they have a number of prominent backers, including journalists Rex Murphy, Lloyd Robertson, Lisa La Flamme, and Peter Mansbridge, singer Susan Aglukark, historian Jack Granatstein, former Quebec premier Jean Charest, Major-General Lewis MacKenzie, and apparently Parks Canada itself, which has reportedly donated $100,000 to the project. Those critical of the plan, however, point out that this sort of memorial runs counter to the mandate of Parks Canada, and that to allow a private corporation to build on park land sets a dangerous precedent for the privatization of our public lands and resources. Indeed, a group of 28 former Parks Canada managers and employees penned a scathing letter condemning the proposed development. While these criticisms have merit, for historians there are other reasons to oppose the construction of the Never Forgotten National Memorial. Simply put, the memorial falls into a trap of blind patriotism by lauding only the sacrifices made by our service personnel during times of war. It is important that as we go through the process of remembrance, we not forget the many other threads that make up the fabric of our collective memory of the First World War. The story of the First World War is more than just an account of those who served abroad — it is also the tale of thousands of volunteers who were rejected for military service, of conscripts forced to serve, of conscientious and religious objectors protesting the senselessness of the conflict, of sacrifice and scarcity on the home front, of a colour bar that limited the wartime participation of minority groups, of divisions between English and French Canadians. As much as the First World War instilled a heightened sense of national unity in the hearts of some Canadians, it brought a terrible sense of discord and division for others. These are less familiar — and less comfortable — aspects of Canada’s First World War experience that were every bit as real as the sacrifice and service of uniformed men and women. While we must continue to remember and study the experiences of servicemen and women, we should not do so to the exclusion of other stories and other groups. Recognizing these varied and competing voices is what historians strive to do, and it can be a challenging task. Indeed, the difficulty in doing so has contributed to the rise of what historical geographer David Lowenthal has termed the “cult of heritage”, whereby we become preoccupied with an image of the past that is devoid of critical engagement with historical analysis or causation. While history strives to uncover the many voices that make up the chorus of years gone by, heritage simply gives a platform to the voice that yells the loudest. And therein lies both its appeal and its shortcomings. If history is messy, heritage is clean; if history is difficult, heritage is easy. The construction of a colossus (the Greek term for a massive statue), as a private initiative on public land, is the worst sort of heritage project — the drive-by variety that distills history into simplistic “heritage” that reduces the men and women who served during the First World War and other conflicts into a homogenous group. Such a memorial projects an image of a country without complexity, free of the divisions of ethnicity, language, class, and gender, and does little to help people understand the gravity of global military conflict. Moreover, this sort of monumental public art project runs counter to both Canadian traditions of commemoration and Canadian artistic trends. Canada has never been in the business of building colossi, probably because this type of figurative art makes such a bold political and cultural statement that it is all but guaranteed to cause division in our bilingual and pluralistic society. Indeed, the practice of building colossi is more in keeping with the nationalistic strategies of dictatorial regimes. It should be noted, for example, that the headquarters of Mansudae Overseas Projects – the global leaders in the constructions of colossi – are found in Pyongyang, North Korea. Canadian universities and design colleges, on the other hand, have given birth to an anti-monumentalist movement, which appropriates public art forms and inscribes them with new, powerful expressions of the costs of war. In an emotional, seven-night vigil in 2004, for example, artists R.H. Thomson and Martin Conboy projected the names of the 68,000 service members from Canada and Newfoundland killed during the First World War onto the limestone of war memorials and public buildings around the country, reviving the significance of the archipelago of cenotaphs across the country. Such focus on existing local memorials, and on the names of the fallen themselves, pays more direct and powerful tribute to those who served and the communities they hailed from than a colossus erected in a part of the country that many Canadians may find almost as difficult to access as the overseas cemeteries and monuments themselves. The colossal statue in particular presents the added problem of arguably drawing more attention to itself than to the fallen that it intends to honour. 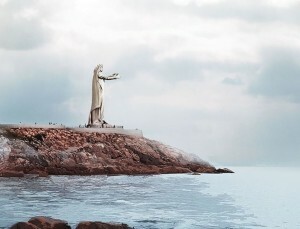 Indeed, the ongoing debate over the monument has put the Mother Canada statue at the centre of public discourse on commemoration, and relegated those the colossus was to honour as secondary players in the still-unfolding drama. For example, a cursory survey of online reactions to the proposed monument reveals a variety of supportive and critical statements. But some critical comments feature a particularly pungent array of jokes mocking the giant statue, with terms such as “zombie” and expressions such as “sleepwalking off a cliff” among the more prominent. If another gesture of remembrance on a national scale is desired, should we not have a design that is more thoughtful, less easily lampooned, with no commercial aspect, and in a location that is more accessible and less environmentally sensitive? And what of existing national monuments within Canada such as the National War Memorial, the Tomb of the Unknown Soldier, and the Peace Tower, with its Memorial Chamber housing Canada’s Books of Remembrance? Are these memorials somehow inadequate? A recent article by historian Yves Frenette points to the difficulties inherent in the public memorialization of war by examining the way the Canadian government commemorated the bicentennial of the War of 1812. In Frenette’s view, the Harper government attempted to reshape Canadian history during this commemoration as a means of pushing so-called “Conservative” historical narratives such as militarism and monarchism to the forefront, with the end result that the government appealed “to an imagined past that simplifies history, makes it fast and easy to consume, and presumes a country free of social distinctions, including those of race and class.” We are in danger of seeing this same process play out again in Cape Breton Highlands National Park. As we commemorate the First World War let us not repeat these same mistakes by offering a simplistic, politicized view of the past. This time let us recognize the many different stories and meanings of the First World War. This time let us choose history over heritage. The authors are Faculty Members in the History Program at Mount Saint Vincent University. A full list of the proposed Never Forgotten National Memorial’s Ambassadors and Honourary Patrons can be found at: http://www.nfnm.ca/about-us. 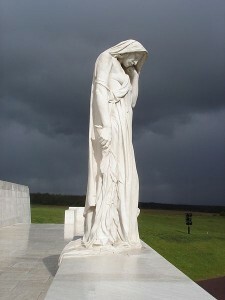 For more on Parks Canada’s donation to the memorial, see: http://www.cbc.ca/news/canada/nova-scotia/mother-canada-project-given-100k-parks-canada-grant-1.3122741. A copy of the letter can be viewed at: https://s3.amazonaws.com/s3.documentcloud.org/documents/2095140/mother-canada-opposing-letter.pdf. This idea is developed in David Lowenthal, The Heritage Crusade and the Spoils of History (Cambridge: Cambridge University Press, 1998). This total includes losses from the Canadian Expeditionary Force, the Royal Newfoundland Regiment, along with Canadians and Newfoundlanders serving in British forces and the Merchant Marine. For example, see the comments at: http://www.cbc.ca/news/canada/nova-scotia/mother-canada-statue-wrong-way-to-remember-say-history-professors-1.3114581. Yves Frenette, “Conscripting Canada’s Past: The Harper Government and the Politics of Memory,” Canadian Journal of History, 49 (Spring/Summer 2014), 53.